So that is everything for tonight's live text. Thank you for joining us and for your comments. Remember, Sportsday Live will be the place to go for the breaking news throughout Monday and that will be on the BBC Sport website from 08:00 GMT, before live text commentary of Crystal Palace v Sunderland in the Premier League in the evening. So until next time, bye for now. So a hugely enjoyable game in Marseille. Thirty shots on goal, but only a third of those on target. Both sides may be calling their players in for some shooting practice later this week. Barcelona will be without France defender Jeremy Mathieu for two to three weeks because of a leg injury. That will rule Mathieu out of Wednesday's Champions League match at Ajax and next weekend's Spanish league game at Almeria. Mathieu suffered an injury to his right leg during Barcelona's 1-0 home loss to Celta Vigo at home on Saturday. Barcelona are currently second in Group F with two wins from three games. So Marseille move four points clear of Paris St-Germain, who they visit next Sunday. Lens are 17th, one point above bottom-placed Evian. Borussia Dortmund and Germany defender Mats Hummels will miss Tuesday's Champions League clash against Galatasaray. Hummels, 25, faces three weeks on the sidelines with a sprained ankle that he suffered during Saturday's 2-1 Bundesliga defeat by Bayern Munich. A fourth straight Group D win would put Dortmund into the knock-out phase, and Hummels could also miss their next Champions League tie - away at Arsenal on 26 November. And that's it. Marseille move four points clear at the top of Ligue 1 after a nervy win against Lens. Nicolas N'Koulou's header was cancelled out by Baptiste Guillaume's first-half equaliser. Florian Thauvin completed a fine one-touch move to restore Marseille's lead, although the hosts ended with 10 men following Alaixys Romao's dismissal for two yellow cards. But Marseille held on for the win. Their next Ligue 1 game... away at champions Paris St-Germain. Great drama in the sixth minute of injury-time. Marseille are indebted to goalkeeper Steve Mandanda for keeping them ahead. Lens substitute Yoann Touzghar is through and only has the home captain to beat, but Mandanda saves the lifted shot with his legs. But Lens waste the chance. A late chance for Lens to equalise. They have a free-kick 35 yards out and central. A farcical moment in Marseille as a broken corner flag causes a stoppage. Stop wasting time and get on with the game. Marseille's Mario Lemina had snapped it, when he kicked it while trying to take a quick corner. Some bloke comes from nowhere armed with some tape to fix the flag and we're back in business. Barcelona striker Luis Suarez says he is relishing facing his former side Ajax when the two teams meet on Wednesday. Suarez, 27, scored 111 goals during a four-year spell with the Dutch club before moving to Liverpool in January 2011. "The match against Ajax is the most important at the moment," said Suarez. "It is a club that gave me everything. I learned a lot and I will always be thankful for that. To return and play in the Champions League with Barcelona will be great." Lens nearly grab an equaliser but Ahmed Kantari's long-range effort whistles narrowly over the crossbar. Anxious moments for the hosts. AC Milan may have dominated the possession this evening but a look at the shots on target shows Palermo more than matched. In fact, the visitors had seven shots on target compared to Milan's three. Five minutes left for the 10 men of Marseille to hang on for the victory that would take them four points clear. Sam Langan: Horror show from #Milan. No passion, grit or ability from anyone. Palermo deserved it. Feel for Inzaghi, his players were poor. Poor is probably being generous Sam. AC Milan are already losing ground with Serie A's top two, while Palermo's win moves them to up to 13th. Rastamadeus FC: I really feel for Fernando Torres, once the best striker in the world. Completely destroyed by Spain, Chelsea and greed. Mitch Mansfield: This time last year, Torres had just scored & assisted for #CFC to beat #MCFC, prompting suggestions he was back. False alarm. Agrah pocho: I pray AC Milan doesn't end up like Portsmouth. Marseille will have to play the last 14 minutes with only 10 men after Alaixys Romao is shown his second yellow card. His dismissal means he is suspended for Marseille's next match - a tasty encounter against champions Paris St-Germain. The final whistle is met by jeers from the home fans. No need to overreact as it is only Milan's second league defeat of the season but they have been dreadful. The last time AC Milan had conceded two goals at home in the league was in March (vs Parma) - I guess everyone has an off night. And, boy, has this been an off night. Let's not take any credit away from Palermo though. They have looked organised, solid and dangerous going forward. Freddy Harper-Davis: Marseille have taken the lead against Lens. Good to see someone giving PSG a run for their money in Ligue 1. Entering the last five minutes at the San Siro and still AC Milan barely threaten. Palmero thoroughly deserve this victory....... Have I spoken too soon? Andrew Priestley: And we thought Manchester United's fall from grace was bad, look what is happening at AC Milan! Seven times European champions. Straight at goalkeeper Stefano Sorrentino by Milan midfielder Nigel de Jong. Wonderful. Lens are sliced open by a lovely passing move involving Marseille's Dimitri Payet, Andre-Pierre Gignac and Florian Thauvin. Payet starts it off by playing a ball inside the left-back which Gignac runs on to and then plays a first-time pass back for Thauvin, who smashes a shot into the roof of the net. Liverpool manager Brendan Rodgers says his side plan to enjoy their away game against European champions Real Madrid on Tuesday. Liverpool side lost 1-0 at Newcastle on Saturday, is not worried about a potential heavy defeat at the Bernabeu. "It's a wonderful game for us on Tuesday," says Rodgers. "It is a big one against the best in the world at the moment. We will go into the game hoping to get something out of it. "Good or bad, we can't complain. We have worked very hard for a couple of years to get to this level and playing against Real Madrid in the Bernabeu says we've been doing OK."
Great chance for Fernando Torres as Riccardo Saponara's left-wing cross bounces through the Palermo defence but his diving header is sent wide. Time running out for Torres to break his San Siro duck this evening, Coming up to the last 15 minutes. Mitch Mansfield: El Shaarawy's reaction to yellow highlights why it won't stop diving - happy to take chances as w/ any other bookable offence. Matthew Hill: ‏AC Milan are better than this, Honda and El Shar will get them back in it... and with that, Honda has been subbed off. Agrah Poch: From Pippo (Inzaghi) to Torres...what a disgrace. Just as I say that, Stephan El Shaarawy almost scrambles a header in at the far post for Milan before Fernando Torres fires a shot across goal and wide. They need to something to change quickly. It is difficult to find the words to explain how bad AC Milan have been so far, but I'll give it a go. Insipid, toothless, lack lustre, limp and clueless. It is beauty and the beast in Marseille. A beautiful run from 19-year-old Baptiste Guillaume, Lens' first-half goalscorer, sees him skip down the left wing and get to the byeline. His pull-back is perfect for Wylan Cyprien, who produces a late Halloween horrible, ugly finish that sees the ball goes well over the bar. Guillaume looks less than impressed with his team-mate's effort. Back under way in Marseille, who will go two points clear at the top of Ligue 1 if the score stays the same. AC Milan are looking a beaten side. Palermo aren't having to do a lot at the moment to keep the hosts at bay and, if anything, the league strugglers are still looking the more likely to score the next goal. Thirty minutes left to prevent just a second league loss under Filippo Inzaghi. Paris St-Germain boss Laurent Blanc has criticised his side's players for underestimating opponents. PSG, who entertain Cypriot team Apoel Nicosia in the Champions League on Wednesday, went 1-0 down to struggling Lorient in their Ligue 1 game on Saturday before recovering to win 2-1. "PSG players must realize that walking onto the field is not enough to win a match,'' said Blanc. "The way we played in the first half is not worthy of a club like PSG. It was the worst first half I've seen since becoming a coach. We were astonishingly poor." Joel Ejike Ikemba: I feel for those loyal AC Milan fans, going from those glory days to what they are witnessing now they gonna be so saddened. El Shaarawy almost makes up for his indiscretion as he curls a shot inches wide from 25 yards. That's better. Stephan El Shaarawy goes tumbling inside the penalty area under Francesco Bolzoni's challenge. The referee blows his whistle but rather than point to the spot, he books the Milan substitute for simulation. El Shaarawy doesn't complain as he knows he dived. Franco Vazquez is being given so much space for the visitors. His 20-yard shot is easy for goalkeeper Diego Lopez, but Palermo probably can't believe how easy this is. It is 1-1 at half-time in Marseille, and that's a fair representation of a thrilling first half. The Ligue 1 leaders went ahead earlier on through Nicolas N'Koulou's diving header, but teenager Baptiste Guillaume equalised with a deflected shot from 12 yards out. Stephan El Shaarawy is on for Milan in place of Andrea Poli as the second half gets underway. Surely Milan can't be as bad as they were in the first 45? Juventus midfielder Andrea Pirlo has already played in three Champions League finals - and he is preparing to play in another one. The Italian side are third in Group A and entertain leaders Olympiakos on Tuesday and Pirlo, 35, a two-time Champions League winner with AC Milan, thinks it is their biggest game of the season. "It'll be like a final for us and we know that there is only one result at our disposal," says Pirlo, who scored in his side's 2-0 Serie A win at Empoli on Saturday. Lens nearly fall behind again. Marseille's Florian Thauvin gets in front of his marker to flick an effort at goal from a corner. But Wylan Cyprien is in the right place on the post to hoof the ball into the stands, with the kind of panicky clearance many of you may have made earlier today in your Sunday League games. Still, the ball didn't end up in the net and we are level at 1-1. So who is going to win Fifa's Ballon d'Or then? Any ideas? Andy: I expect another rout by Ronaldo and co v Liverpool. Too hot to handle considering Liverpool's defensive struggles. That Gym Guy: As an Arsenal fan it kills me to say; 'Chelsea to win it'. Mourinho knows what he's doing. Bayern Munich will be aiming to win some trophies at the end of the season, but defender David Alaba is already celebrating after retaining his title as Austrian Sportsman of the Year. Alaba, 22, won the award in 2013 and clinched it again in 2014, finishing one vote in front of downhill skier Marcel Hirscher, who won a silver medal in the men's slalom at the Winter Olympics in Sochi. "I am overwhelmed," said a clearly delighted Alaba. Marseille have just had two warnings, and are made to pay soon after. It is awful defending from the hosts as they fail to clear their lines. The ball falls to Baptiste Guillaume, who twists and turns inside the penalty area to create space for a shot on goal. He doesn't strike it well, but it takes a nick off Rod Fanni and goes past Steve Mandanda for an equaliser. It is a cracking game so far in the south of France. Andre Ayew could have doubled Marseille's lead, stinging the palms of away goalkeeper Valentin Belon, before Benjamin Bourigeaud and Pablo Chavarria shoot wasteful off target at the other end. The vanishing spray is out as Keisuke Honda lines up a free-kick for Milan just 18 yards from goal. His effort is easily blocked though and the half-time whistle is met by San Siro jeers. And still Palermo come forward. Edgar Barreto advances through Milan's midfield, passes to Franco Vazquez and the midfielder drags a shot wide. Milan haven't come from 2-0 behind in Serie A at the San Siro for more than a decade. The omens aren't good. Nicolas N'Koulou put Marseille ahead earlier in the game and he is probably the reason the hosts still have 11 men on the pitch. Lens striker Pablo Chavarria turns Alaixys Romao and looks to be through on goal, before Romao cynically brings him down. He would have been sent off for a professional foul if N'Koulou had not been close by. The referee controversially adjudges that N'Koulou would have got back to tackle Chavarria, and Romao is only booked. Chelsea can qualify for the knockout stages of the Champions League on Wednesday, but goalkeeper Thibaut Courtois is already hoping for more this season. Courtois, 22, played in last year's final while on loan at Atletico Madrid and believes Jose Mourinho's side could do even better. "We have the quality to win the Champions League, but there's other strong teams - Bayern (Munich), Barcelona, Madrid - so you need a little bit of luck not to play against them before the final," said Courtois. "I played the final last year so I want revenge for that defeat and win the Champions League." It it wasn't for goalkeeper Diego Lopez, Milan would be out of this game by now. This time, Edgar Barreto's volley is turned over the bar from 20 yards. Lens have responded well to going behind to that early Nicolas N'Koulou diving header. Pierrick Valdivia has an attempt on goal from 25 yards out, which should be comfortable for Steve Mandanda. But the goalkeeper makes it look like hard work and only succeeds in punching the ball high into the air, but his team help out to clear the danger before Valdivia shoots well wide. Milan have been dire in this first half an hour. They can have no complaints at being 2-0 behind, in fact they should be grateful the deficit isn't worse. Not many were predicting this pre match. We said it was a bright start, now it's a leading start. And it is a lovely goal. Nicolas N'Koulou flings himself head-first to connect with a spectacular diving header after Florian Thauvin's corner from the right wing took a deflection off Lens' Jerome Le Moigne. Ligue 1 leaders Marseille, who lost 1-0 at Lyon last Sunday and then 2-1 in the League up on Wednesday at Rennes, make a bright start against Lens. They have a good shout for an early penalty as a visiting defender has a handful of Andre-Pierre Gignac's shirt as the ball is played into the box. But referee Bartolomeu Varela gives nothing. Gignac complains, but can't change the official's mind. This is extraordinary. Milan are all over the shop as Palermo double their lead. Just seconds after being denied by goalkeeper Diego Lopez Paulo Dybala again burst clear of the hosts's defence and this time makes no mistake as he fires into the top corner. The San Siro is stunned. Milan need to wake up as substitute Cristian Zapata heads into his own net from Palmero's corner. Nothing the visitors haven't deserved. Fierce low fizzing strike from 20 yards by Jeremy Menez is inches wide of the post. The Milan striker is looking lively early on. Manchester City played their last Champions League match in front of empty stands, but that will not be the case on Wednesday, as their game against CSKA Moscow is sold-out. The first tie in Russia ended 2-2 with only a small number of supporters in the ground as CSKA were serving a ground ban following racist chanting by their supporters. But City, who have offered home fans two seats for the price of one, have sold more than 46,000 tickets for the game at Etihad Stadium. Their last home Champions League match only had an attendance of 37,509. SaMmiiEE....T.N.T: Inzaghi has been doing well for Milan. A win today takes them to third. With more funds we can see Milan in Europe next year. First yellow card of the game as Costa Rica's Giancarlo Gonzalez sends Keisuke Honda sprawling on the left flank. The resulting free-kick is swung in and Fernando Toress glances a header wide. Good effort by the Spaniard . And we are under way in Marseille, as they aim to move four points clear at the top of Ligue 1. Close by Milan. Jeremy Menez's clever flicked pass with the outside of his foot puts Andrea Poli through on goal. But the midfielder can only poke the ball wide with goalkeeper Stefano Sorrentino beaten. Lens aren't having a good time of things. With just 11 points from 11 games, Marseille will expect to stretch their lead over PSG to four points again. Palmero have had 20 coaches since owner Maurizio Zamparini bought the club in 2002. He obvioulsy hasn't heard of stability then. Milan are starting to enjoy a bit more of the ball now. Somebody obviously forgot to tell Palermo they are supposed to be the whipping boys this evening. The Serie A strugglers have started brightly and look as though they could cause Milan problems. John McEnerney: On current form Real Madrid and Bayern Munich look like finalists. Barcelona won't be able to adjust to having an out and out number nine, and their defence is suspect. Dushyanth gowda: Have a feeling Man City will beat CSKA Moscow and Bayern will beat Roma. Man City to go second. No pressure then? Marseille may have lost their last Ligue 1 match but history suggests the title is already in the bag. A blow for the hosts as defender Alex limps out and is replaced by Cristian Zapata. Almost the perfect start for Palermo. Franco Vazquez bursts through a non existent Milan defence but his shot across goal is well parried by goalkeeper Diego Lopez. Good save but the midfielder should score. We are underway at the San Siro. Teams are out at the San Siro. 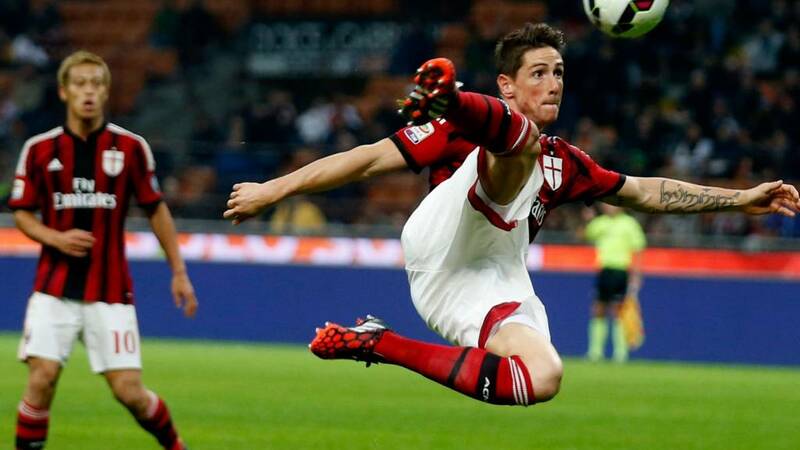 Can Milan get the victory they need to move third in Serie A.
Fernando Torres. From hero to laughing stock - probably the best way to sum up his time in England. Now, with an Italian adventure at AC Milan underway, can he re-find the form that saw Chelsea pay £50m to Liverpool for his services? Form that horribly deserted him during his spell at Stamford Bridge. Things haven't started brilliantly at Milan for him since signing on a two-year loan deal in the summer, with just one goal in seven appearances. Can he break his San Siro duck against Palermo this evening? Belgian champions Anderlecht, who face Arsenal on Tuesday, needed an injury-time equaliser to stay top in the latest round of matches in the Pro League. The Gunners will qualify for the knockout stages of the competition if they beat Anderlecht and Borussia Dortmund do not lose at home to Galatasaray. Anderlecht only have one point from three games, but are still leading Belgium's domestic league as Gohi Bi Cyriac scored a late equaliser in their 1-1 home draw against Lokeren. The Rossoneri will fancy their chances of getting back to winning ways against A Palermo side who have only won twice all season. The Sicilians are going into the clash with a bit of confidence though after their 1-0 midweek triumph over Chievo. The victory lifted the islanders out of the drop zone and into 15th place. The above picture is pop star Paloma Faith by the way - see what we've done there? Palermo, Paloma - close enough. Marseille: Mandanda, Lemina, Fanni, N'Koulou, Mendy, Romao, Imbula, Thauvin, Payet, A Ayew, Gignac. Subs: Aloe, Alessandrini, Andonian, Samba, Tuiloma, Batshuayi, Barrada. Lens: Belon, Cavare, Landre, Kantari, Baal, Bourigeaud, Le Moigne, Cyprien, Valdivia, Chavarria, Guillaume. Subs: Touzghar, Coulibaly, N'Diaye, El Jadeyaoui, Gbamin, Ba, Henriques de Pinho. Palermo have taken just one point of a possible 12 on the road this season and have given away a total 17 goals so far. They take on the best attack in the league, with Milan having found the back of the net 18 times. Sam Langan: I've watched a lot of Milan this season and impressed. Inzaghi's created a hard to beat side. Not always fluid, but OK start. Palermo: Sorrentino; Munoz Gonzalez Andelkovic; Morganella Bolzoni Maresca Barreto Lazaar; Dybala Vazquez. Wales forward Gareth Bale could feature for Real Madrid in their Champions League home tie against Liverpool on Tuesday. Bale, 25, has missed Real's last five games with a pelvic muscle injury, but returned to training on Sunday. His club boss Carlo Ancelotti has also played down suggestions that Bale will find it difficult to regain his place in the side. "Everyone thinks that Bale is a problem, but he is a player that will help us to be even better," said Ancelotti. Real will qualify for the knockout stages if they beat Liverpool. So as always, we want to hear from you and your thoughts on this week's Champions League action? What do you expect and hope to see from the latest round of matches? Also, who are going to be the Champions League champs and chumps? Let us know your predictions and reasons why a certain team will be a success or a failure. Let us know your thoughts on Twitter, using the hashtag #bbceurofooty or text us on 81111. In France, league leaders Marseille host Lens after two consecutive defeats in the space of four days. Marcelo Bielsa's team first saw their eight-match winning streak in the league come to an end with a 1-0 defeat at Lyon before Philipp Hosiner's late strike helped Rennes to a 2-1 victory in their League Cup match on Wednesday. Time to show us what you are made of. There are signs AC Milan are finding a bit of form this season. Filippo Inzaghi's men have lost just once and are on a six-match unbeaten run. But they head into this weekend's encounter at the San Siro, on the back of two straight draws, sitting nine points behind leaders Juventus in seventh. After finishing eighth last campaign, 45 points behind champions Juventus, there is certainly room for improvement. Good evening and welcome to a live text that will take you on a whistle-stop tour around Europe. We will be based in Milan - only figuratively speaking sadly - for the Rossoneri's Serie A visit of Palermo, while also keeping a close eye on Ligue 1 leaders Marseille as they entertain Lens. But, with the Champions League group stages now getting serious, we will also start building up the action to come as well as recapping what has gone on around Europe this weekend. Ready? Good. Lets get going. Liverpool's Champions League trip to the Bernabeu on Tuesday is just one of 16 group games to be played this week around Europe. But, if Brendan Rodgers' men's woes aren't bad enough at the moment, surely no player in the world can strike greater fear into defender's hearts than Ronaldo at the moment? Perhaps time to start building a wall Brendan? Feeling a bit hot Cristiano? Ronaldo has scored in 12 successive matches. Notched 22 goals in 15 Real Madrid appearances this season. And has hit the net in both his Champions League appearances.